Cuter Commuter: Hello, I'm Daly. People often ask me what is Cuter Commuter. Since I can't always point them to the About Cuter Commuter page, I made this short video for fun. Cuter Commuter's mission is to encourage the utilitarian use of bicycles as a lifestyle. Through education, advocacy and social activities--and by being a role model, I hope to inspire other people, especially women, to ride their bicycles to work, to school, to run errands, to fun, and to...EVERYWHERE!! 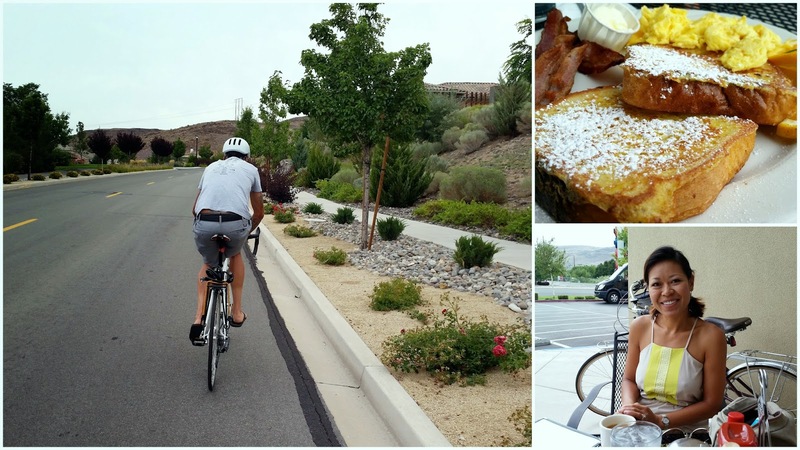 This morning my husband and I rode together to have breakfast at Peg's Glorified Ham n Eggs in Sparks. There's a safe, quiet residential street from South D'Andrea Parkway to a bicycle pedestrian path that run north and south along Sparks Boulevard. The path led us right to Prater Way where the restaurant is located. Short and easy. It was about 6.5 miles roundtrip from where we live. Good thing we had a nice long hill to ride back up on our way home because I needed to work off that yummy breakfast!! Have a happy and safe Sunday! !